Lighting design in Maya is similar, but not completely identical, to how it's done in the real world. You have several types of lights to choose from in Maya; each one has unique attributes and benefits, and you'll learn what each type is best used for. When you know how to work with lights, scenes that once rendered dull can take on a new radiance. Most of the time you're trying to get a realistic effect with your lights, and Maya's virtual lights do not work in a realistic way—in particular, beams of light within Maya do not reflect off surfaces. In the real world, even a single light source can fully illuminate a room because its beams reflect from surfaces to reach areas under desks and shelves .In Maya, however, those areas are completely dark, so one solution is to simulate diffuse reflection by adding many low-level lights. Creatively, lighting defines the scene's mood. If you're trying to create a chilling, spooky effect, you'll probably want dim lighting in the scene. For a feeling of suspense, you might decide to have flickering lights. Lighting in a scene creates the shadows, influences colors, and directly affects the appearance of materials. The results of a well-lit scene are worth the effort and time. Skillful lighting creates contrast between objects, enhances the colors in your scene, and gives you more control over the scene's shading. Several different lights are available in Maya 5, each with its own properties and uses: Ambient, Directional, Point, Spot, Area, and Volume lights. The Ambient light type creates light on all surfaces. It is in no way comparable to the real-world ambient light that creates the diffuse reflection of surfaces. Instead, it's a kind of auto-self-illumination that brightens all parts of your scene equally. For this reason, this light type should be used sparingly or for special cases only, or it can give your scene a washed-out or flat appearance. Maya's Ambient lights can also cast shadows. 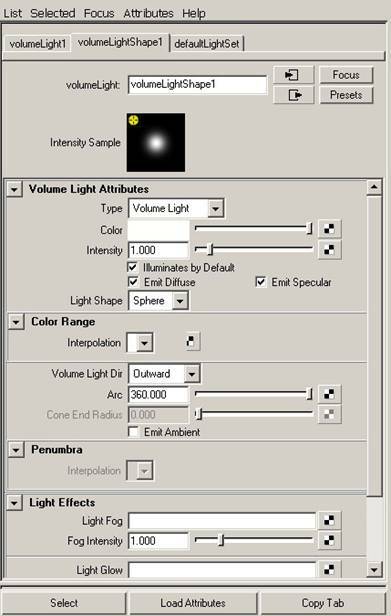 In essence, these features allow you to use Ambient lights as though they were Point lights, with a variable "shine everywhere" setting. 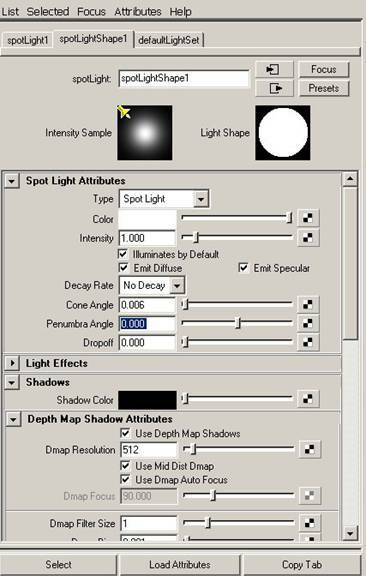 This setting is called Ambient Shade, and the light behaves more like a Point light as this value approaches 1. The Directional light is the default light used when you create a new scene. This light is good for emulating rays of light coming from the sun and does a fine job of lighting the entire scene instead of just targeted areas. Unlike the Directional light, which has light rays that are parallel to each other, a Point light casts rays of light evenly in every direction from a point. Point lights are sometimes used for simulating omni directional light sources, such as light bulbs. The Spot light's area of illumination is defined by a cone, and within the cone's specified range, light is cast evenly. Starting from an infinitely small point in space, a Spot light spreads as it moves farther from the origin. Spot lights are useful when you're trying to create beams of light from, for example, a prison watch tower, a lighthouse, and so forth. With Area lights, you can have a source of light that doesn't just come from an infinitely small point in space. The Area light emits rays from a rectangular area in space and can be scaled larger or smaller. This makes an Area light a great choice when you're looking for realistic lighting, but be forewarned that it takes longer to render. By using an Area light, you'll get shadows that soften as they're cast farther from the shadow-casting object. 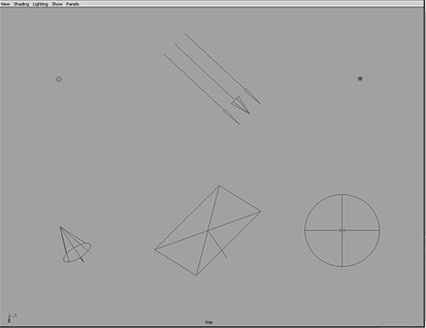 Maya uses only two-dimensional flat Area lights that are rectangular. Volume lights have a visible range of influence that allows you to see exactly where the light dies out. By default, the light intensity falls off linearly from the light's center point to the visible outer boundary. This type of light is ideal for interior lighting, because you usually want lights to fade with distance if they're primary sources of light.